U.S. Rep. Beto O'Rourke, D-El Paso, a Democratic candidate for U.S. Senate, speaks at a campaign stop at The Social Club on Sunday, Sept. 23, 2018, in Edinburg. The Valley has long struggled with voter turnout. Will November be any different? 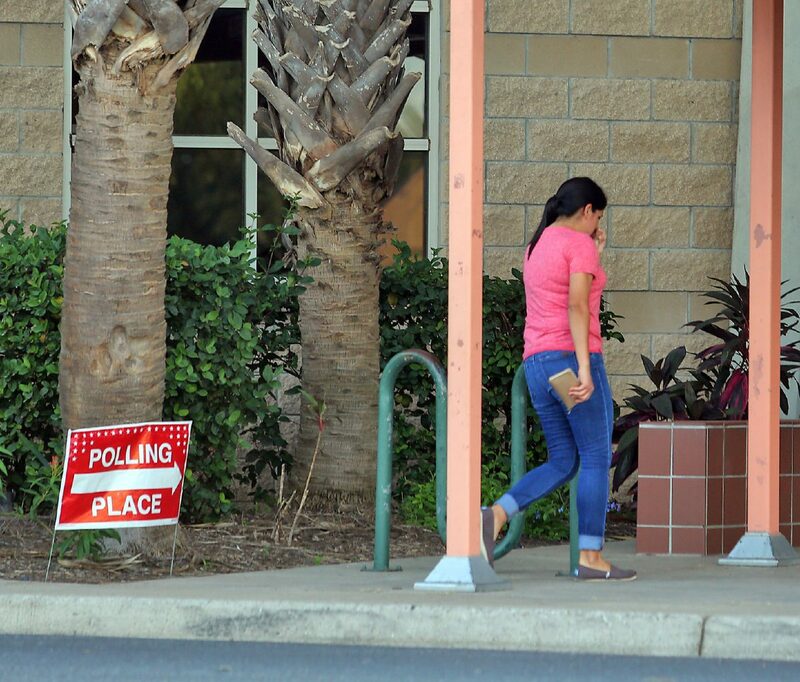 McALLEN — The question of voter turnout in the Rio Grande Valley has never confused statewide political candidates. Many treat the region like U.S. Sen. Ted Cruz has this election cycle. The incumbent Republican has held one campaign event in the Valley since the March primary. Democratic gubernatorial candidate Lupe Valdez has also sparingly visited South Texas. Because of this campaign strategy common with both parties, or perhaps in spite of it, Valley residents do not show up to vote in large numbers. So why, as Cruz races to a Nov. 6 election against Democratic challenger Beto O’Rourke, has the Valley become a strong focus for one of the candidates, and not the other? O’Rourke’s Democratic Party typically takes South Texas for granted while Republicans consider the area a lost cause. Hillary Clinton overwhelmingly won the region in the 2016 presidential election; Cruz won just 31 percent of the vote in his 2012 bid. This election cycle has seen a diversion from the standard campaigning strategy. A surge of interest in O’Rourke has brought the candidate down to two campaign events in recent weeks, and O’Rourke will be in the region twice more before early voting begins on Oct. 22. The interest has also resulted in an uptick in registered voters — there are 10,000 more in Hidalgo County than there were in the March primary, according to the county’s elections administrator. But recent history, and political observers, suggest the Valley will likely not swing this election. And it’s understandable why, analysts said. In Hidalgo County, multiple municipal elections have been frauds. A woman bought votes in a 2012 Donna school board election with cash and cocaine, and was charged in federal court. Three years later, the Texas Attorney General filed 16 charges against a Weslaco city commissioner for voter fraud. And just Friday, a state district judge ruled Mission’s recent mayoral election void, also because of illegal voting allegations. With perception of sham elections growing ever so common, voters can be turned off by the process. And a common thread in elections is voters think their ballot won’t make a difference. But with nearly 10 trips over the last year to the Valley once election day hits, O’Rourke is hoping to inspire a different thinking. But Joshua Blank, manager of polling and research at the Texas Politics Project in Austin, thinks the swing of voter registration is a bit misguided. “It’s the symptom, not the cause,” Blank said, citing three reasons: The relentless partisan national politics at the moment is unavoidable for people; Democrats are running more candidates in areas they normally don’t; and there’s heavy interest across the country in the Cruz-O’Rourke race. Texas has been growing, and interest in politics has, too. Hidalgo County saw nearly 173,000 ballots cast in the 2016 presidential election; the 2014 midterm elections saw about half of that. With the county now at 359,000 registered voters, O’Rourke, and Democrats in the region, are cautiously optimistic. They’ve seen interest before — this isn’t the first time a Democrat running for statewide office brought hope to ending the party’s 25-year-old drought of winning a statewide election. U.S. Rep. Filemon Vela, D-Brownsville, was elected to Congress the same year as O’Rourke. 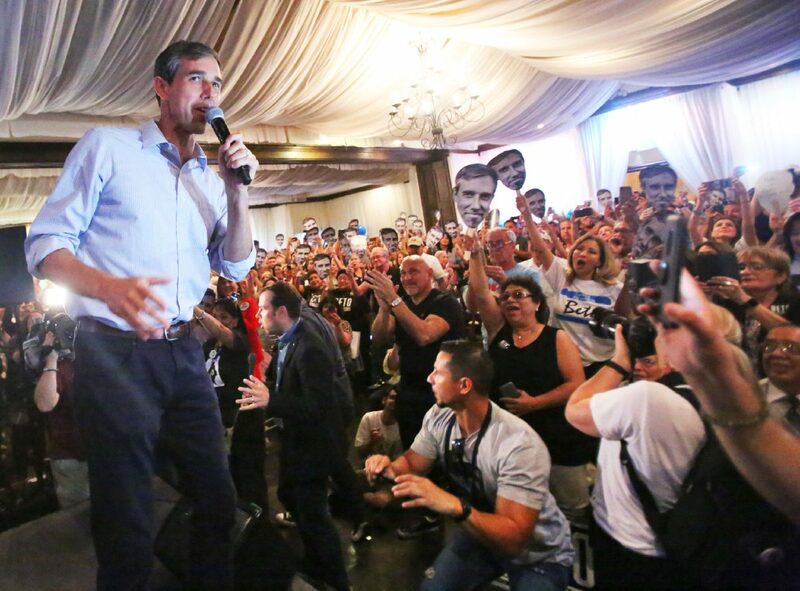 Vela introduced O’Rourke to a lively Brownsville VFW crowd earlier this year. Vela, however, recognizes the state’s Democratic history.